Like film, printing paper is coated with an emulsion containing light-sensitive compounds. The negative is a reversal of the tones in the original scene. In order to create a positive within a photographic analog environment, a darkroom is necessary, including an enlarger, easel, safelights and processing trays. Unlike film developing, printing photographic enlargements can be done under dim amber safelights. A darkroom is typically divided into two separate sections – a dry side where the enlarger is located and a wet side with the paper processing chemistry located in a sink. It is important not to contaminate each area to insure the proper handling of materials. Utilizes one or more lenses to concentrate light directly on negative, allowing for short exposure times, and higher contrast. Scatters unfocused light over the negative, allowing for lower contrast and minimized dust effects, but longer exposure times. Bounces light from high-intensity tungsten-halogen bulb into a diffusion chamber where color filters (magenta, yellow and cyan) control desired amounts of variable contrast for black and white printing or the color balance for color printing. Prior to the start of each semester, each enlarger is thoroughly cleaned, adjusted and calibrated for proper operation. It is important that the enlargers are used as instructed with care and consideration for problem-free use. Only have the lamp on when the enlarger is in use. Don’t leave the enlarger with the lamp on. This is can burn out the lamp as well as cause the negative to buckle in the negative carrier causing problems with image sharpness. Always release (untighten) the enlarger lock when raising and lowering the enlarger. 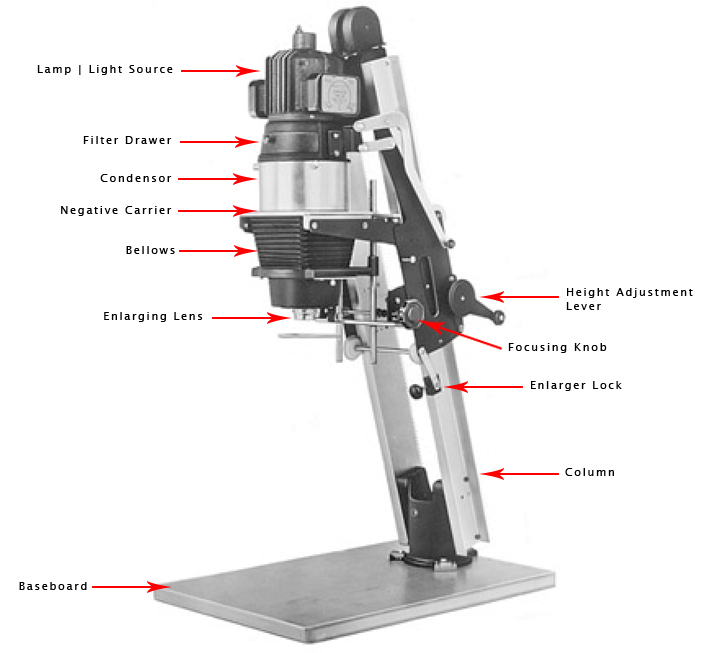 Failing to release the enlarger lock while attempting to adjust the enlarger height will cause the gears to be stripped as well as affect the overall sharpness of the enlargement. 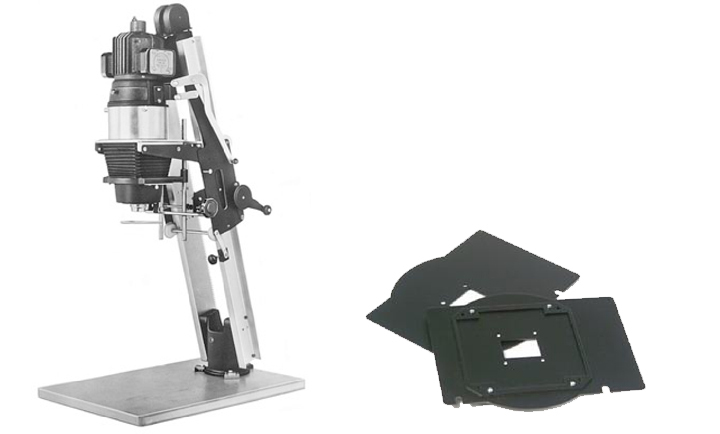 Don’t leave the enlarger head in the up position after inserting or removing negative carrier. If left in the up position, once the enlarger lamp is turned on, light will scatter throughout the darkroom, damaging unfixed prints. Don’t remove lens or change the condenser position from the enlarger. If another type of lens is required, ask the instructor or lab technician. Negative Carrier	Insure the negative carrier is properly seated in the enlarger. When making image-resizing adjustments to the easel, always open the easel and insure it is in the locked position before moving the easel blades. Photographic chemicals should be handled with reasonable care. The goal is to avoid getting chemicals onto and/or into your body. If at any point, you get chemicals on you, into your body or there is a chemical spill, it is important to take action of the incident immediately, including washing the chemical off, and letting the instructor and/or lab instructor know to assist immediately for the safety of yourself and others in the lab. If you do get chemicals on your skin, wash immediately. Replace skin oils with a good hand lotion. If you do get chemicals in your eye, wash immediately with cool running water from the nearest source, faucet or eyewash station for 15 minutes. Get immediate medical attention after washing eye. Per the Photography Department Lab rules; there are no food or drinks allowed in the film processing rooms and darkrooms. Wash hands after working with chemicals in both the film processing rooms and darkrooms, especially before eating. The Photography Department Lab has ventilation in both the film processing rooms and darkrooms to insure fresh airflow. Particle masks are available for you to use. If a spill occurs it is important to contain the spill and notify the instructor and/or lab technician immediately to determine how the spill should be cleaned up. Clean your clothing and shoes if they come into contact with the chemical. Closed-toe shoes are to be worn at all times when working in the darkroom and film processing rooms. No sharing of print developer trays and vigorous agitation of the trays. Always use tongs when moving prints from one solution tray to the next. Do not transport the prints with your hands. Don’t poke at prints with tongs. Always keep prints face-up with the exception of the final wash. Final print washes are done in groups of 25 prints or more. There is no individual washing of prints allowed. When reviewing prints in white light area, always use a tray and insure all water is drained from the tray. Printing paper in which varying grades of print contrast can be obtained by the use of variable contrast filters. Printing paper, which produces a single contrast of print contrast, requiring a change in paper grades when less or more contrast is desired in the print. Density | overall brightness or darkness of a print. Contrast | difference between the brightest and darkest areas of a print. Highlight | very bright area in a print. Midtone | area of medium brightness in a print. Shadow | very dark area in a print. Negative or print with minimal differences in brightness between light and dark areas. Necessary to use a higher contrast filter. Negative or print with very significant differences in brightness between light and dark areas. Necessary to use a lower contrast filter. To move a solution over the surface of film or paper during processing to insure fresh chemistry comes into contact with the surface. Agitation should take place during each step of the printing process by gently rocking the tray. Chemical solution that converts the latent image (still invisible) in exposed film to a visible image. Chemical solution that stops the development of the print. Chemical solution (sodium thiosulfate or ammonium thiosulfate) that makes a photographic image insensitive to light. Fixer, also called Hypo, dissolves unexposed silver halide crystals while leaving the developed silver image. Preliminary rinse to minimize residual fixer from contaminating archival rinse. 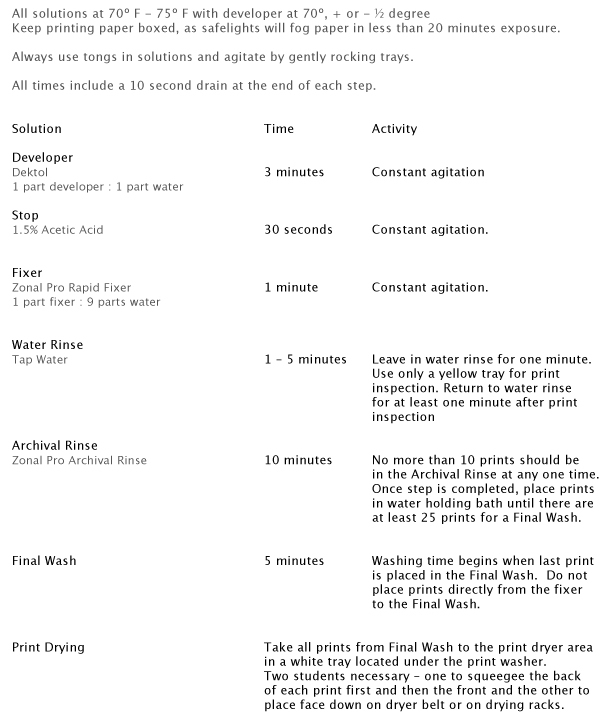 Chemical solution the removes residual fixer from print and to increase the effectiveness of the wash. Final water wash to remove residual chemicals from print. Either with a print dryer or print drying screens, which are more archival. Secure enlarging station. Place all personal items either below enlarging station or in print finishing room. Open black and white photographic paper in darkroom under safelights only. Do not open box in the light. Set-up work area so it is not cluttered and it is easy to access negatives, printing paper, filters, and burning | dodging tools. Proceed to follow the steps for making contact sheets and/or enlargements. In addition, follow the steps provided in the Grossmont College | Print Processing Guide.pdf that outlines print processing steps. 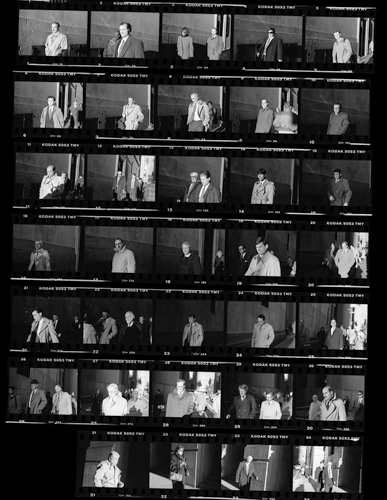 The contact sheet is a visual representation of the film shot and is used to edit which negatives should be enlarged and printed. It is the process of placing the negative(s) in contact with sensitized material, such as photographic paper, and then passing light through the negative(s) onto the material. 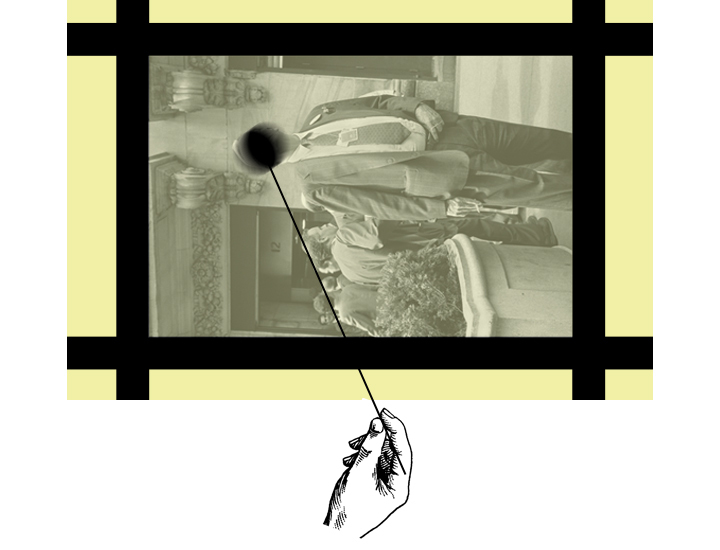 The resulting image is the same size(s) as the negative(s). Place the empty 35mm negative carrier into the enlarger and gently lower the lamphouse onto the carrier. Open filter drawer and insert #2 printing filter. Release the enlarger lock and set the enlarger height to level ‘30’ on the calibrated column. Set the aperture of the lens to its widest setting. Turn on lamp with the timer switch, and adjust the focus until the projected rectangle of light is sharply defined across the registration marks on the baseboard. Cut one sheet of enlarging paper into four 2” x 10” test strips. Replace all but one strip back into the paper box, as paper will fog when left out. Place one strip of negatives with the film emulsion side (dull side of film) in contact with the paper emulsion side (shiny side of paper). The negatives and paper should now have emulsion-to-emulsion contact. Close contact printing frame and align with the registration marks on the baseboard. Stop the aperture of the lens down to f/4 or f/5.8. Set the timer to 45 seconds. Use the cardboard to cover all but the first frame on the test strip. Press the timer button, and move the card each half-frame of the negative strip in turn as the pointer moves past 40, 35, 30, 25, 20, 15, and 10 seconds. Remove card for the final 5 seconds. Remove test strip and process. View the test strip in an inspection tray in normal room light. Evaluate the progressive tones of the clear film along the edges of the film where the sprocket holes are located. After determining which end of the test strip represents the least/most exposure, choose the section of the test strip, which represents the shortest exposure necessary to produce maximum black from the area of the clear film. Set timer to the number of seconds determined from the test strip. Place all of the negatives from the roll of film in contact with a full sheet (8” x 10”) of paper (film emulsion in contact with paper emulsion). Note the exposure time, aperture, and filter number on the back of the paper in pencil. Return contact printing frame within registration marks and press timer button for exposure. 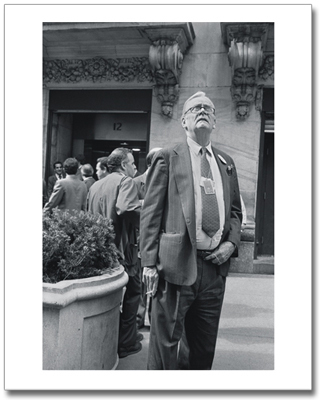 The photographic enlargement is an image, usually a photographic print that is larger than the negative. 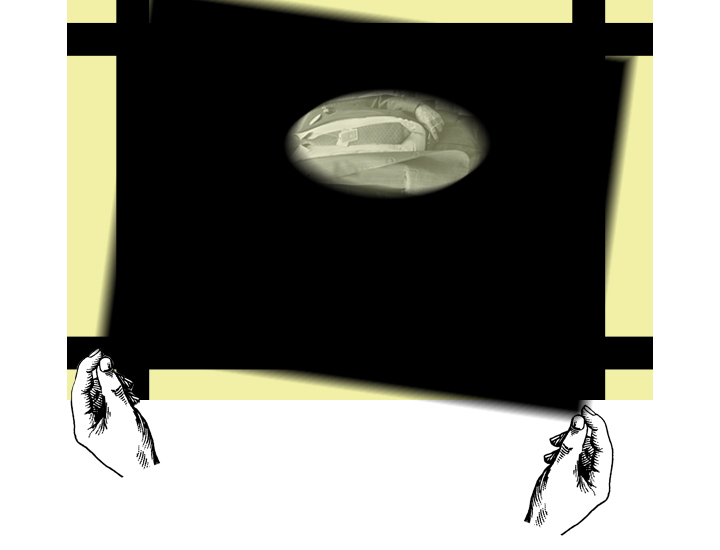 It is made by projecting an enlarged image of the negative onto sensitive paper. Select a negative from the contact sheet, which you would like to work with. The negative should suggest not only an engaging image conceptually and visually, but should also reflect a good exposure and tonal range that is neither too dense nor too thin. Place negative emulsion side down in the empty 35mm negative carrier and insert the negative carrier into the enlarger. Gently lower the lamphouse onto the carrier. 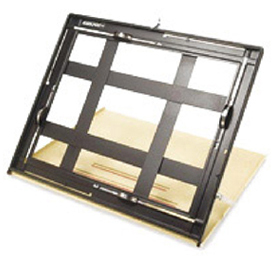 Set the adjustable easel blades for a 6” x 9” image size for 8″ x 10″ enlargement with 35mm negatives. Release the locking screw and adjust the enlarger height so that when the image is focused, there is a narrow white line (1/16”) on all sides of the projected image. This is to insure full-frame printing of the entire negative. When sizing the image on the easel, it is helpful to have the aperture set at its widest setting. Use the grain focuser to insure the sharpest possible focus of the image. Once the image has been focused, stop the aperture of the lens down to f/8. Cut one sheet of enlarging paper into two to three – 2½” x 10” test strips. Replace all but one strip back into the paper box, as paper will fog when left out. Place the test strip in the adjustable easel with the paper emulsion side up (shiny side of paper). The test strip should include highlight, midtone and shadow areas of the negative. Set the black pointer on the timer to 40 seconds. Evaluating the Test Strip	1. View the test strip in an inspection tray in normal room light. Evaluate the progressive tones of the entire test strip, including the highlight, midtone and shadow areas. After determining which end of the test strip represents the least/most exposure, choose the section of the test strip, which represents the sufficient exposure and density in the highlight, midtone and shadow areas so that description is in each of these areas. If the exposure times become too short, approximately 10 – 15 seconds, it may be necessary to stop down the aperture further. If the exposure times become too long, over 60 seconds, it may be necessary to open the aperture an additional stop(s). So as to insure correct exposure / density and contrast in the highlight, midtone and shadow areas of the negative, it may be necessary to change the filter to either lower or raise the contrast. Once the exposure time and aperture combination as well as the proper filter have been determined, note the exposure time, aperture, and filter number on the back of the paper in pencil and on the Printing Record. Place a full sheet (8” x 10”) of paper with the emulsion up in the sizing slot of the adjustable easel and close the easel and press timer button for exposure. Utilize any secondary printing controls, such as dodging, during the exposure, and/or burning, after the initial print exposure. After a print is made with satisfactory high values (indicating a desired printing exposure) and satisfactory low values (indicating a desired level of contrast), there may be some local areas of the image which still do not achieve the desired tonal value and level of description. These secondary, local printing controls are called dodging and burning. To decrease the density (lighten) a specific area of a print by giving it less exposure. Dodging is done during the main exposure and is usually used to brighten specific areas of an image, including shadow areas, to reveal more description and detail. Using a dodging tool, the technique is useful over a range of approximately 5% to 15% of the main exposure. To increase the density (darken) a specific area of a print by giving it additional exposure. Burning is done after the main exposure and is usually used to darken specific areas of an image, including highlight areas. Using a burning tool, the technique is useful over a range of approximately 20% to 400% of the main exposure.